ONE OF THEIR BIGGEST RELEASE DAYS YET! Clean Teen Publishing and Crimson Tree Publishing are celebrating one giant release day today as they launch four amazing titles. From much anticipated sequels to a highly sought after spin-off series, CTP has the perfect read for you today. Check out the new titles below that are available to purchase today and don’t forget to scroll all the way to the bottom of this post so you can join in on the release party this coming Friday! Jennifer Anne Davis’s best-selling True Reign series captivated readers from the very first page. Now, get ready to become entangled in the follow-up series, Reign of Secrets. In this new series, follow Allyssa, the daughter of the beloved Emperor Darmik and Empress Rema— and find out what happens after happily ever after. In a world of science, magic is an abomination, but not the vile creation Royal Inquisitor Simon Whitlock once believed it to be. Accompanied by his apothecary companion, Luthor Strong, and Matilda Hawke, a werewolf, they return to the capital of Callifax, eager to convalesce after their last adventure. Their peace is short-lived, however, as they are quickly sent on another mission. It seems the iron mines of Whitten Hall have ceased their production, no longer sending its ore to the crown. The Ministry of Trade has sent inquiries, but its representatives have all fled from the train ride to the distal outpost. It seems a vampire stalks the trains in and out of Whitten Hall, a vampire that will reveal the secret of the iron mine and the darkness that resides within. 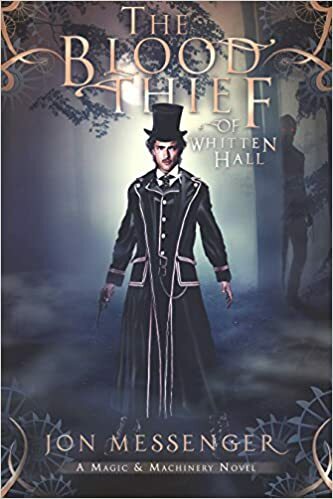 The Blood Thief of Whitten Hall is the second book in the Magic & Machinery Series by Jon Messenger. Read Wolves of the Northern Rift today for free. Seconds Before Sunrise is the exciting sequel to Minutes Before Sunset by Shannon A. Thompson. Find out why readers are enthralled with the Timely Death Trilogy. How can Ava St arr’s dream come true be Dax Miller’s worst nightmare? Ava’s mother always told her to be careful what she wished for. From the moment Ava woke up on Lamarai Island, she wanted nothing more than to find Preston. But now that she has, her heart is caught in a fierce game of tug-of-war. In a place where danger lurks around every tree, she must quickly figure out who she can trust, and who is out to destroy her dream of a happy ever after. Dax’s plan to capture Ava’s heart was all falling into place. That is, until Ava’s past showed up on the island in the form of a tall, dark, and handsome pilot named Preston, leaving Dax to wonder if he’s inherited Ava’s wicked luck. Preston is determined to pick up his relationship with Ava where they left off before a plane crash separated them, but Dax will stop at nothing to fight for the girl of his dreams and discover the truth behind the mysterious pilot. But Dax isn’t the only one troubled by the surprise appearance of Preston and his flight crew. The new visitors to the island have caused Dax’s stepsister, Roxy, to develop a bad case of sibling rivalry, as well as managed to attract the unwanted attention of a vicious tribe of cannibals. Now Dax must figure out a way to keep his new tribe of misfits safe, while Ava is left to make the most important decision of her life. Will they succeed, or will fate decide for them? Wicked Fate is the heart-pounding sequel to Wicked Luck, a new adult adventure romance series. Join the virtual party this Friday between 7pm-9pm (Eastern) and celebrate our amazing releases this month. There will be so many giveaways, you won’t be able to see straight. Gift cards, swag, signed books, and more. Our authors have gone all out to provide the most entertaining party for our readers yet. Make sure you stop in for the fun. It’s free and better yet, you can attend in your pajamas…or whatever. Click the link to join the party on our Facebook event page, and you will get a reminder on Friday when the fun starts. JOIN THE PARTY!